The Boxerman, an adorable medium-sized pup, is a cross between a Boxer and a Doberman Pinscher. Thankfully, these crossbreed canines hit the genetic lottery. Both parent breeds are generally very healthy, so there are only a few minor health issues that Boxerman’s face throughout their lifetime. There are the rare major health issues, such as life-threatening bloat or bone cancer, but early detection through routine vet visits can help avoid them. Some of the minor health problems that your Boxerman may face are described below. Hip dysplasia is a condition which occurs before birth, during development. The hip joint is malformed, resulting in rubbing or popping out of the socket. It causes cartilage deterioration, arthritis, and permanently awkward, painful gaits, in the worst cases. Surgery is the only way to correct this condition entirely. 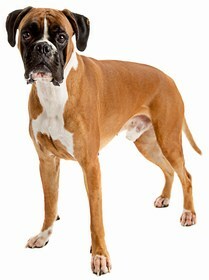 Also, due to the Boxer genetics, the Boxerman is prone to skin allergies involving fleas, grass, dust, and mites. Symptoms include blotchy skin, severe itchiness, mutilation from scratching, recurring ear infections, redness, swelling, inflammation, and grumpiness. A vet can do tests to discover the cause of the allergy, then prescribe medication to prevent further allergic reactions. Other minor health issues include cherry eye, cataracts, and heartworms. The average Boxerman lifespan is between 10-14 years. However, in some cases, healthy Boxerman pups could live upwards of 16 years. It depends on their health and the genetic lifespans of their parent breeds. 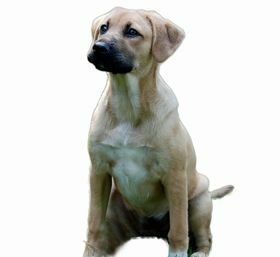 Clever, quick, and keen, the Boxerman is an alert, attentive pup that would make a great watchdog or guard dog. She has been trained in many cases as officer companions and military canines. While mostly non-aggressive, she has a loud, startling bark and ferocious growl that would scare away most intruders. She could easily be trained to protect your family throughout the night. And she would make an extra-protective nanny dog around children. The Boxerman is powerful and strong, but good-natured and even-tempered. She has patience, but small dogs and children could wear on her nerves. Teach your other pets and any children that are around how to act around a Boxerman. She needs to be treated with both love and respect. Teach them to avoid climbing on her, pulling her ears or tail, and making grabs for her food or toys. She can be a bit selfish, so her toys are off limits to both children and other dogs. 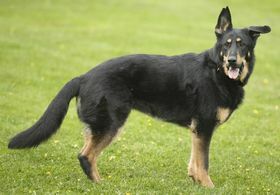 Exercise-wise, your Boxerman is an active, energetic dog that loves to play outside. She would have loads of fun at a dog park, but she won’t tolerate other dogs challenging her dominance. She needs lots of mental and physical stimulation to occupy and exercise both her mind and body. Keep her in a plentiful supply of chew toys, Frisbees, tennis balls, and tug-of-war ropes. She can be left alone for long periods of time, but avoid leaving her by herself overnight. If you’re going to be gone for more than 12 hours, ask a trusted friend to walk and play with your Boxerman while you’re away. Fenced-in backyards are heaven for a Boxerman. She loves to be independent in her explorations, so she would love discovering new things around your backyard. She might give chase at the first sign of a squirrel, but you can train her to stay away from small animals. Training a Boxerman is hard work. She has an independent streak that she will use to challenge your authority. Set your feet, firm up your tone, and let her know that you are the alpha. As soon as she sees that you are dominant and unrelenting, it is easier to get her to comply to your commands. Keep treats on hand to reward her for being obedient. 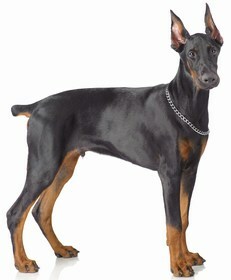 Both the Boxer and Doberman Pinscher have short, dense fur that is sleek against their bodies. Your Boxerman will likely have the same, but she may be a prominent shedder. Keep a vacuum handy, just in case. Brush her hair daily to prevent dander build-up and to keep her coat shiny, smooth, and soft. Eliminating loose hairs with a strong-bristle brush will give her coat an overall healthier sheen. Bathe your Boxerman when she needs it. Her coat is prone to picking up debris outside, but she’ll only need a bath once or twice a month. Use gentle dog shampoo. Adult or kid shampoo for humans can strip the good oils from her coat, making her skin vulnerable to bacterial infections, fleas, and mites. Your Boxerman has a voracious appetite. It takes a lot to maintain her energetic, healthy nature, so feed her 3 cups of dry kibble to keep her sated throughout the day. Divide her dog food into two meals, one in the morning and one at night. This will establish an eating routine that she can count on, so her hunger will be more likely to develop at these times. This is a great way to prevent begging and food aggression. Lucky for you, the Boxerman is a popular, easily found crossbreed. There are plenty of breeders who specialize in annual litters of these hybrid puppies. You can expect to pay between $450 to $800 for a Boxerman puppy from a breeder. But you should also think about the long-term costs of routine vet visits, nutritious dog food, toys, and updated vaccinations. Throw in flea treatments, micro-chipping, spaying or neutering, and deworming. In all, you are looking at over $1,100 for a Boxerman puppy, for starters. If you get lucky enough to find a Boxerman pup at a local shelter, adoption fees run between $200 to $300. This depends on age, health, and general history of the dog. Ranking takes into account a few basic factors including cost, skill level needed, high vs low maintenance and how critical regular training is to success. 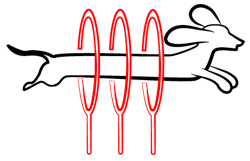 The Boxerman ranks a 2.5 on the integration scale. She is a bit difficult to train, but those with determination, perseverance, and patience will find it to be a rewarding experience. When properly trained and socialized, the Boxerman crossbreed is a great dog for an active family, couple, or single.